A U of A engineering professor researching carbon storage has been awarded funding to set up a one-of-a-kind lab that will simulate the harsh conditions that exist two kilometres beneath the Earth's surface. Rick Chalaturnyk has been awarded $1.6 million in funding from both the Alberta Science and Research Investments Program and the federal Canada Foundation for Innovation for a $4-million research lab that will be the only one of its kind in Canada. The remainder of funding will come from the university and industry supporters. Researchers at the lab, called the Geomechanical Reservoir Experimental Facility, will investigate carbon storage and enhanced oil recovery using leading-edge equipment that will give them a better understanding of how carbon dioxide behaves underground. 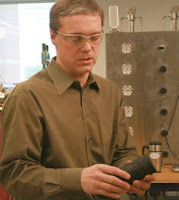 Using a large high-powered centrifuge, Chalaturnyk and his colleagues will be able to increase the size of their standard test samples from small cores to a half a cubic metre in size, apply up to 5,800 pounds per square inch of pressure to the sample and use highly sensitive acoustic imaging techniques to "see" the way carbon dioxide injected into the ground will behave in its liquid, gas and supercritical phases under different pressures and temperatures. They will also be able to simulate steam-injection oil recovery methods, heating the samples to temperatures as high as 350 C, an experiment that is "not for the faint of heart," according to Chalaturnyk. "At 350 degrees metal starts to change," he said. "It's hard to get sensors to measure what's going on. There aren't many plastics that can withstand that temperature. You can't stick electronics in there-even using fibre optics at that temperature is a very difficult thing to do. We'll have these tiny sensors, barely 3 millimetres in size, which we will be using to record what is going on in the sample." The lab will also enable researchers to study the way cement behaves at certain depths and temperatures. Because carbon dioxide can be injected into the ground at abandoned oil and gas wells, it is essential to understand how well the cement borehole casings hold up if the storage site is to maintain its integrity. While helping educate the next generation of geo-engineers, the lab will also advance Alberta's commitment to become a leader in carbon capture and storage, to reduce greenhouses gas emissions while allowing development of unconventional energy sources like oilsands, shale gas, bitumen carbonates and coal-bed methane.